Every webmaster knows that you need a lot of links pointing to your website in order to get some traffic. Some of it comes directly through the links, and some results from improved search engine rankings. There are literally dozens of ways to find and negotiate new links to your website. Unfortunately, not all of them are equally productive, and most of them are very laborious and time-consuming. So, it is hard for a webmaster to find a truly efficient mix of methods. Some website owners give up and only do link building occasionally, and some obsess themselves with a single method and stop considering anything else. Recently, I decided to update my knowledge of link building techniques and find out which ones work best today. I did some reading, but then decided that wasn’t enough and started asking around in forums. I wanted to hear about real results from real people. That proved very helpful. Proven link building techniques you use regularly? 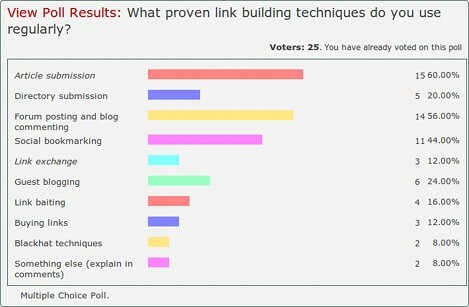 With these poll results, I had some grounds to review my usual link building habits. But how could I be sure about the results? After all, it is natural that asking around in forums produces responses skewed towards social media. Being the author of Web Tracking Guide, and having a habit to test and track everything before jumping to conclusions, I developed a method to track and optimize link building campaign performance that I want to share with you today. You need multiple diverse link sources. You want to be safe if some of your sources stop working in future. Also, you don’t want search engines to see that all your links are coming from the same 10 domains. You want a steady flow of fresh links. Not only will this grow your traffic and restore what you lose from the old disappearing links, but this will also prove to search engines that your content is in demand today. You don’t want to waste your time. Why spend time and money on techniques that don’t work? Find the most efficient methods, and discard the rest. You can see several columns corresponding to different link building techniques. It doesn’t matter what techniques you start with – maybe just whatever you use today. Simply setting a weekly goal and tracking your actual performance will make you more motivated and improve your results. I personally like to also record the total figures from these tools in the same table every week. This gives me some sense of instant gratification to keep me motivated, and this is also useful for additional analysis in future. Please notice that the last technique in my table is “something new”. That is not a placeholder. I believe it is essential to try something new on a regular basis. Then, you can add new permanent columns for new findings that work, and discard old methods that are getting less efficient. You can adjust your weekly goals / expectations as time passes, and you learn more about your link building performance. All figures do not have to match perfectly. The main thing is to approach link building thoughtfully, and work smart rather than hard. I hope my method will help you get better traffic and search engine rankings. Good luck! How to: Conduct Foreign Language PPC Campaigns How Many Links Is Too Many?